Yvonne is a young mother in eastern Democratic Republic of the Congo. When she was a girl her parents sent her to school for just two years. Then she stopped to take care of her younger sisters and brothers. 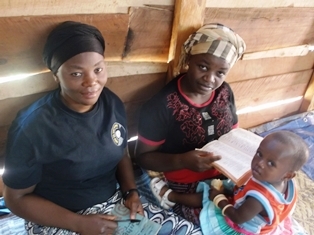 Yvonne married Rutikanga, a pastor who became a Bridge to Reading trainer. They had six children when Rutikanga died unexpectedly in 2011. Though a single mother who struggles to support her children, Yvonne decided to give her time to the church and to tutor other women. With the goal of learning to read well enough to become a tutor, Yvonne went back to the local primary school for two years. She met her goal and was trained in the local training center to become a literacy tutor.